Single point lock with chrome door handle, ensures safe storage of hazardous materials. Integrated leak-proof sump, safely contains any hazardous chemical spillages. Robustly constructed steel cabinet with reinforced doors. Supplied with 'Harmful/Irritant' COSHH exclamation mark label. COSHH labelling supplied loose, including 'Health Hazard', 'Acute Toxicity', 'Corrosive' and 'Aquatic Toxicity' labels. 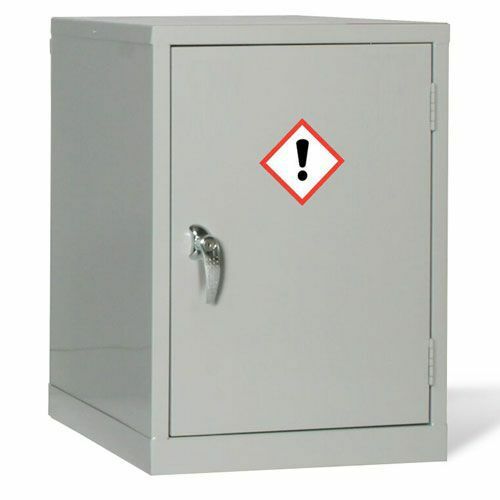 Safely store hazardous chemicals. Cabinet with 1 shelf and a leak-proof sump.